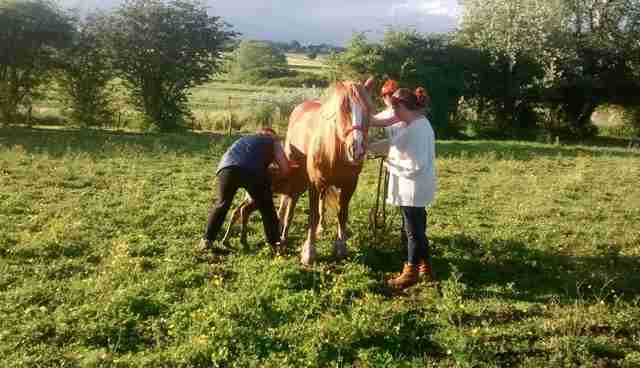 When a family noticed that their newborn baby horse wasn't drinking from his mom, they knew he might be in trouble. The little guy was born around lunchtime and hadn't tried to nurse all day. When a horse is first born, it's crucial that he drinks colostrum from his mom in the first few hours to keep him alive. 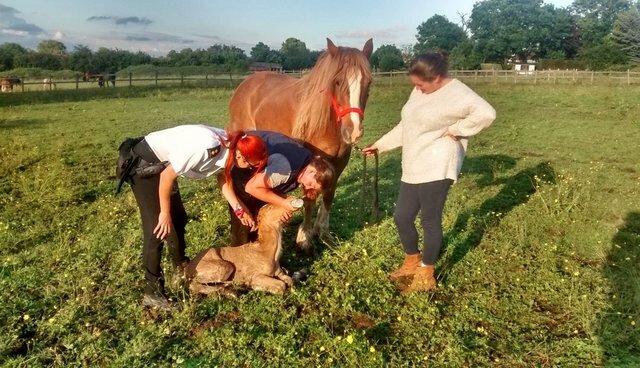 The family quickly called the RSPCA, which arrived to find the baby collapsed on the ground with his mom nervously standing over him, clearly in distress. "When we saw him on the ground, we knew something was wrong and that we had to act fast," RSPCA Inspector Lucy Brennan said in a press release sent to The Dodo. 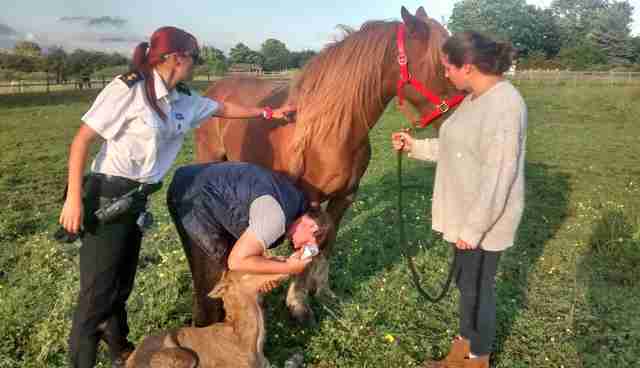 The RSPCA called on the Essex Horse and Pony Protection Society to help them out, hoping that more people would mean quicker solutions. 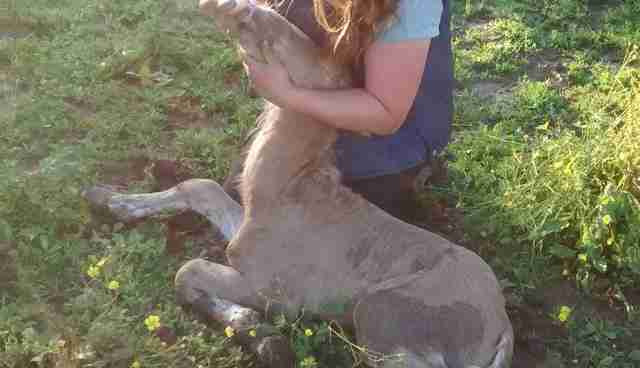 The rescuers tried their best to get the foal to stand up, but he kept falling back down. After consulting a vet, they began knocking on the doors of local houses to try and locate a baby bottle. If the baby couldn't drink on his own, then they were going to help him. 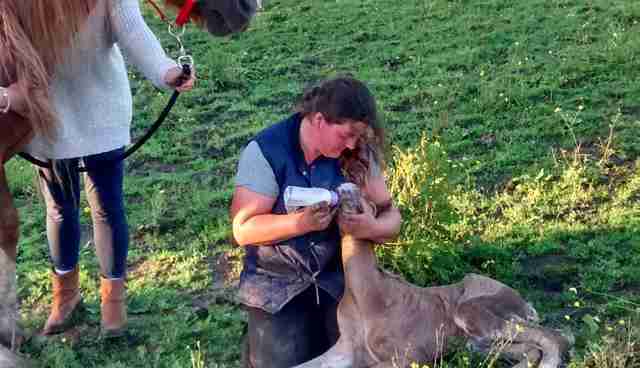 After finding a bottle, the group was able to milk the mom and feed the baby what he so desperately needed to stay healthy. After a little while, he began to appear a little healthier, and his mother was a little more relaxed. Now, the little foal is doing so much better, and has no problems eating or walking around. His first few hours were pretty scary, but now he's healthy and can go on to live a very happy life.